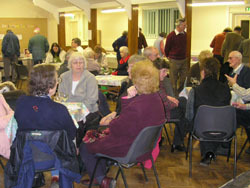 The Village Hall was the venue for The All Saints Church Silent Auction held on Wednesday 17th January 2007 in aid of the Church Extension Fund. A wide variety of items were available to bid for, which had been generously donated by local businesses and members of the local community. These included a three course meal for four, two week stay for one dog at local kennels, various ornaments, clay pigeon shooting, miniature cricket bat signed by "Freddie Flintoff", generator, tables, food hamper, a 10" Newtonian Reflecting Telescope and many other items. The bidding commenced with the lighting of a candle, which burnt for approximately 1 ½ hrs. During this time people wrote their bids on a sheet of paper beside each item, some waiting until the very last minute before doing so, in the hope of ensuring a successful bid. When the candle went out, bidding was stopped and the items went to the last name and bid on each sheet. 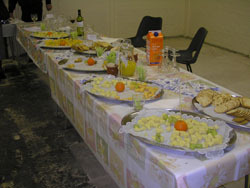 Throughout the evening light refreshments of cheese and wine (or fruit juice) were available and included in the ticket price. The Auction was attended by approximately 60 to 70 people and an enjoyable and interesting evening was had by all. £1,000 has so far been raised which will go towards the building of an extension to the north wall of the Church, to house a toilet with disabled facilities and a tea room. Thanks are extended to all those who attended, donated items, were involved in the organising and who helped make the occasion a success.